Atletico head for second-placed Barca, who they eliminated from the Champions League last month, with a three-point cushion. Match ends, Atlético de Madrid 1, Málaga 1. 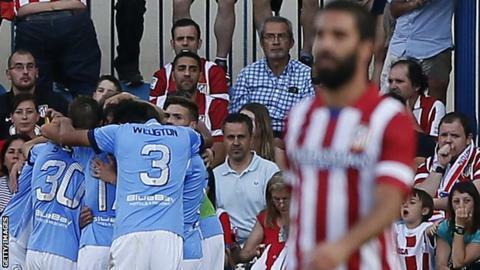 Second Half ends, Atlético de Madrid 1, Málaga 1. Attempt missed. David Villa (Atlético de Madrid) header from the centre of the box misses to the left. Assisted by José Sosa with a cross following a corner. Corner, Atlético de Madrid. Conceded by Willy Caballero. Attempt saved. Adrián (Atlético de Madrid) right footed shot from the left side of the box is saved in the top centre of the goal. Assisted by Gabi. Offside, Atlético de Madrid. Adrián tries a through ball, but Filipe Luis is caught offside. Substitution, Málaga. Bartlomiej Pawlowski replaces Nourredine Amrabat. Attempt missed. José Sosa (Atlético de Madrid) right footed shot from outside the box is close, but misses to the left from a direct free kick. Second yellow card to Marcos Angeleri (Málaga) for a bad foul. Foul by Marcos Angeleri (Málaga). Gabi (Atlético de Madrid) is shown the yellow card for a bad foul. Vitorino Antunes (Málaga) wins a free kick in the defensive half. Corner, Atlético de Madrid. Conceded by Vitorino Antunes. Offside, Málaga. Nourredine Amrabat tries a through ball, but Juanmi is caught offside. Toby Alderweireld (Atlético de Madrid) wins a free kick on the left wing. Foul by Nourredine Amrabat (Málaga). Substitution, Málaga. Juanmi replaces Samuel. Duda (Málaga) is shown the yellow card. David Villa (Atlético de Madrid) wins a free kick on the right wing. Attempt missed. Diego (Atlético de Madrid) right footed shot from outside the box is too high. Assisted by Juanfran. Tiago (Atlético de Madrid) is shown the yellow card for a bad foul. Ezequiel Rescaldani (Málaga) wins a free kick in the defensive half. Hand ball by Diego (Atlético de Madrid). Substitution, Málaga. Ezequiel Rescaldani replaces Roque Santa Cruz. Goal! Atlético de Madrid 1, Málaga 1. Toby Alderweireld (Atlético de Madrid) header from the centre of the box to the bottom left corner. Assisted by José Sosa with a cross following a corner. Attempt saved. David Villa (Atlético de Madrid) right footed shot from the centre of the box is saved in the centre of the goal. Assisted by Gabi.